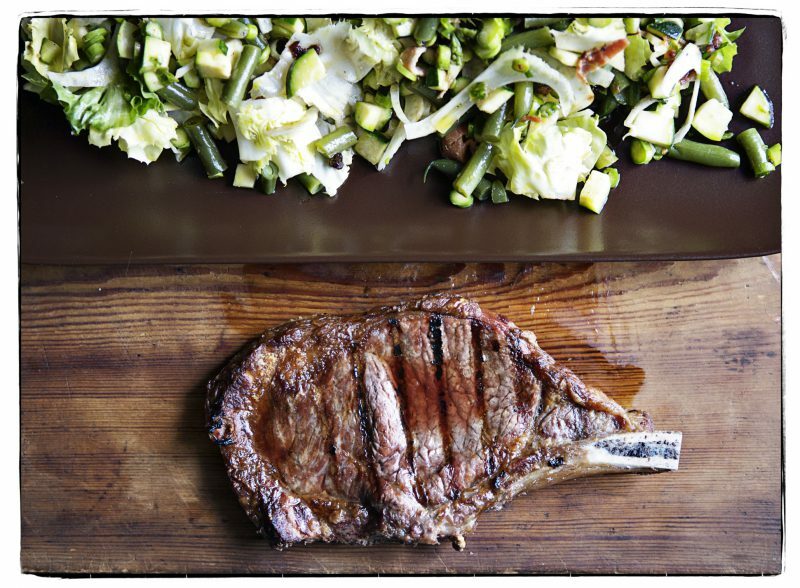 For lunch today we grilled a steak in the fireplace and threw together a chopped salad with cooked and raw vegetables dressed with a lemon vinaigrette. 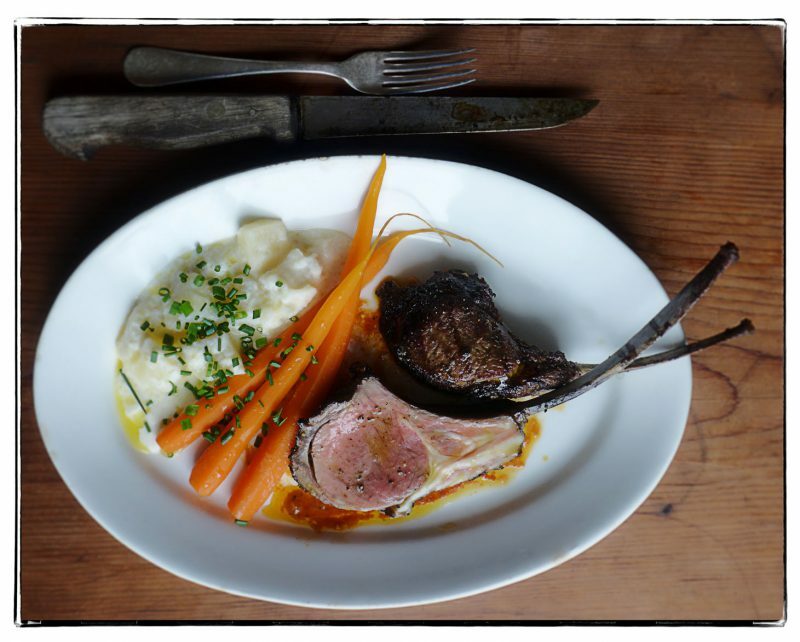 We’ve been talking about Easter dinner for a month and we are still tinkering with the menu. 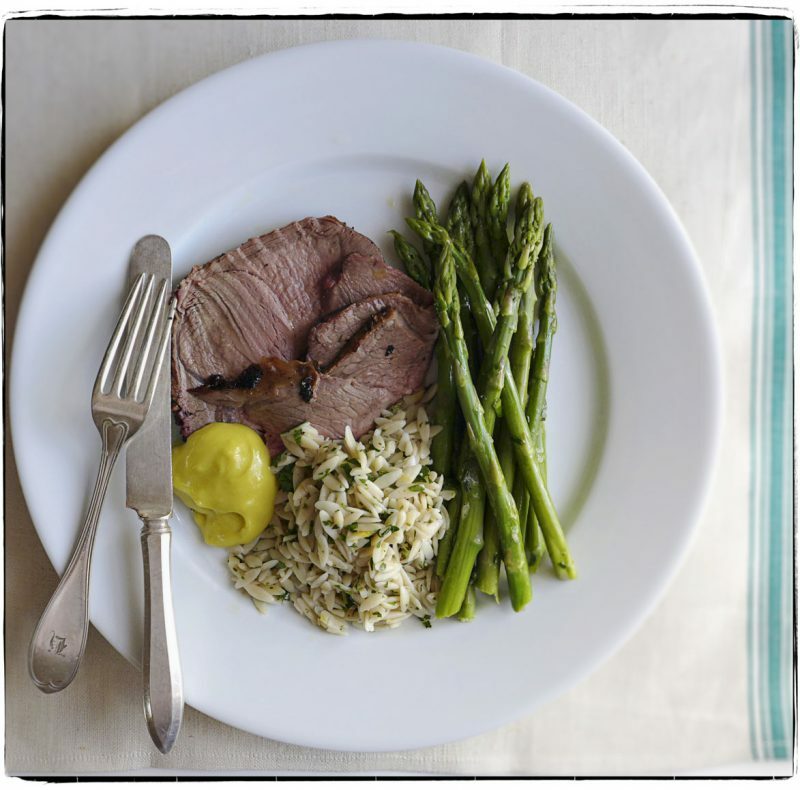 We know we are grill-roasting a leg of lamb, that’s for sure. Perhaps gnocchi verde, watercress soup, potatoes dauphinois, it’s hard to decide. We have to fit asparagus in there somewhere. This is just our kind of dilemma. We’ll be thinking of you this weekend and hoping that you are cooking something delicious. Have a lovely Easter, dear friends. OK, we are hungry again! 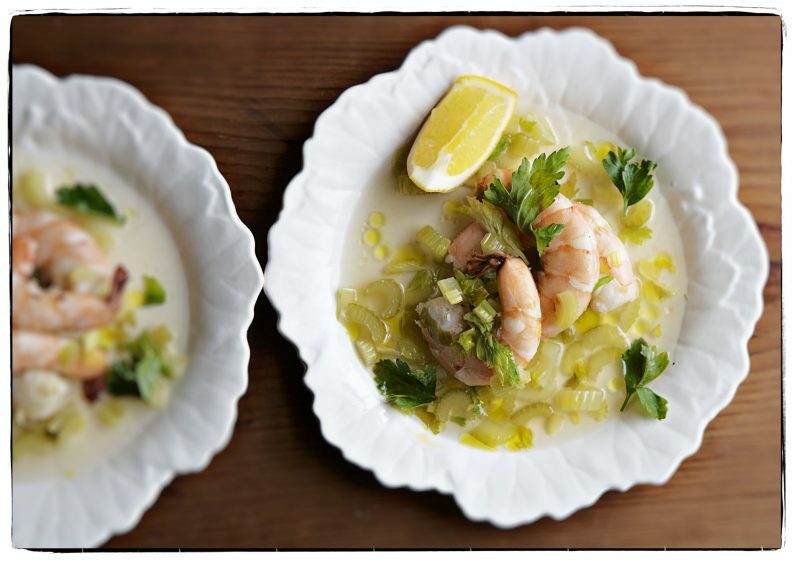 So for our second course we are having pickled shrimp with celery. Hope it holds us til dinner! We couldn’t wait for lunch this morning, for some reason both of us were starving. 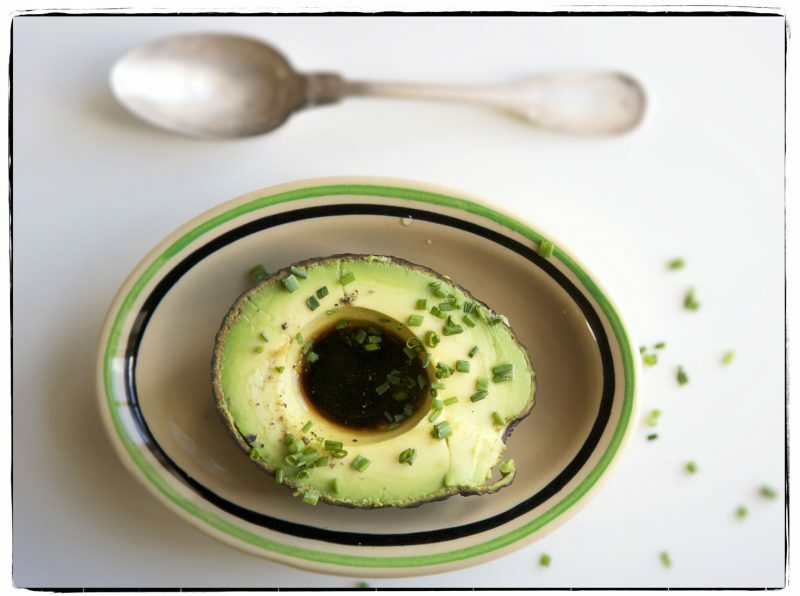 To avoid chewing off an arm, we halved a perfectly ripe avocado and filled the centers with mirin, sesame oil, and shoyu—sweet, nutty, salty, and delicious. Now we’ll have to think of the next thing to eat. It is going to be a good day. This was our dress rehearsal for Easter lunch—grilled leg of lamb, beautifully browned and perfumed with smoke and rosemary, with a spoonful of aïoli. Even though we are watching our waistlines, we had to make orzo with lots of parsley, lemon zest and juice, olive oil, and dried peperoncini to add a little heat and spice. Pencil-thin asparagus were dressed with a pecorino vinaigrette. We gave it rave reviews (if we do say so ourselves). Hippity hop! 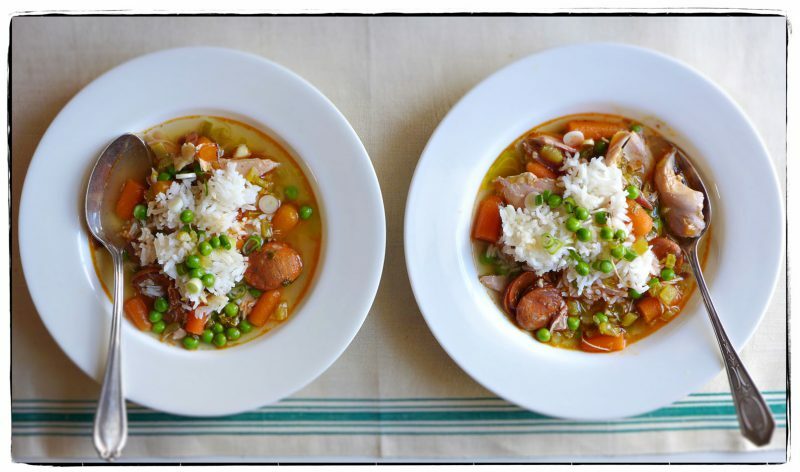 It’s chicken and chorizo soup with a big scoop of jasmine rice for lunch on this fine spring Tuesday. After we slurped up the spicy broth, fragrant soft rice, and all the fixins, we bolted out the door to walk along the towpath with Henry, the dog—restless spring behavior lures us into the beautiful outdoors. We’ll be back before dark. 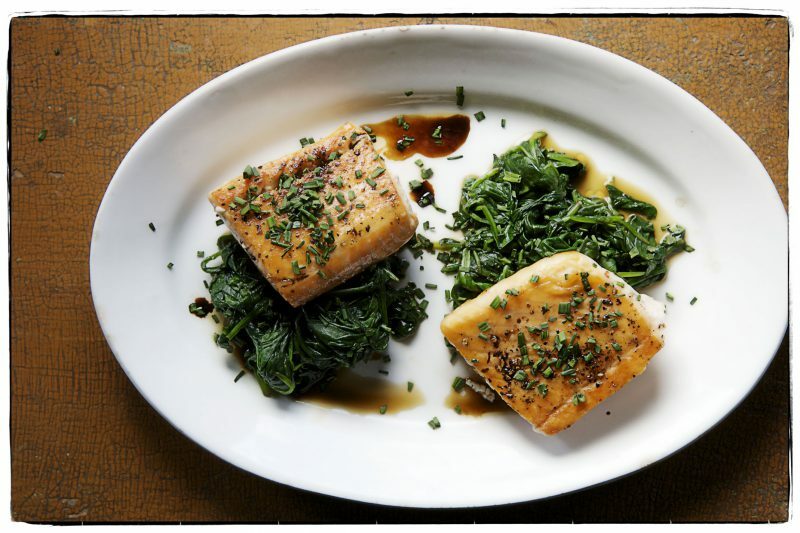 It’s pan-seared salmon on spinach dressed with oyster sauce and sesame oil for lunch today. We need to eat a little fish to replenish the diminishing brain cells. If anyone is in the neighborhood at noon this Saturday, we’ll be serving kabocha squash soup with butter & chutney pumpernickel sandwiches at the Williams-Sonoma in Bridgewater, NJ. Come on by, we’d love to see you. If you are too far away, think of us this weekend as you cook something delicious for yourselves . 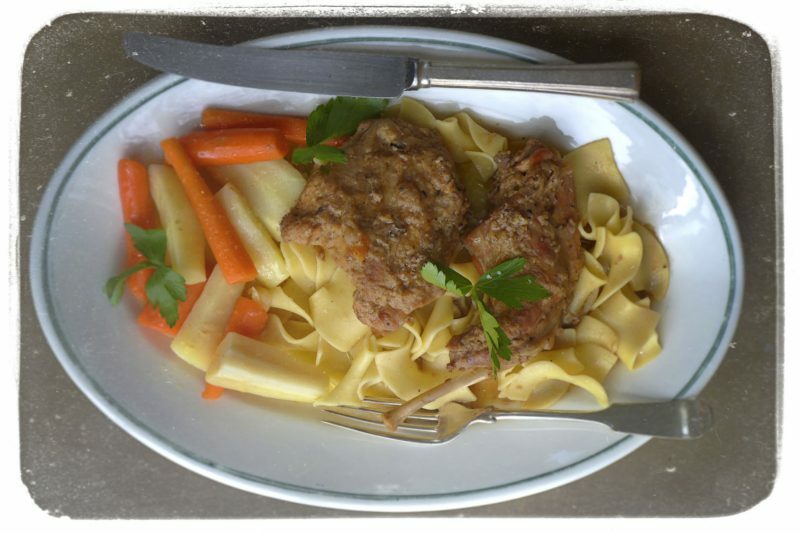 We are off to NYC this afternoon, so for lunch today there was only time to warm up last night’s leftover rabbit stew with parsnips and carrots on egg noodles. As most things do, it tasted even better the next day. We have duly fortified ourselves to take on the city. Full disclosure, this was actually yesterday’s lunch that we shared with Maureen Fitzgerald, food editor of The Philadelphia Inquirer, and writer Joy Manning who contributes to that illustrious newspaper. Joy brought her lemon pound cake with its perfect crumb. The day was grey and drizzly so it felt cozy to linger at the table in the warm pools of lamp light. We sat there all afternoon, talking everything over as we are wont to do—home cooking vs professional cuisine, funny family food stories, recipes, and lots of general philosophizing. Such a nice visit, reaffirming our belief that stopping to eat a little something midday with friends is time very well spent indeed. We’ll finish the pound cake with tea this afternoon. Early this morning we pulled a fat, hard-as-a-rock stewing hen out of our narrow freezer—we needed to make a little room. 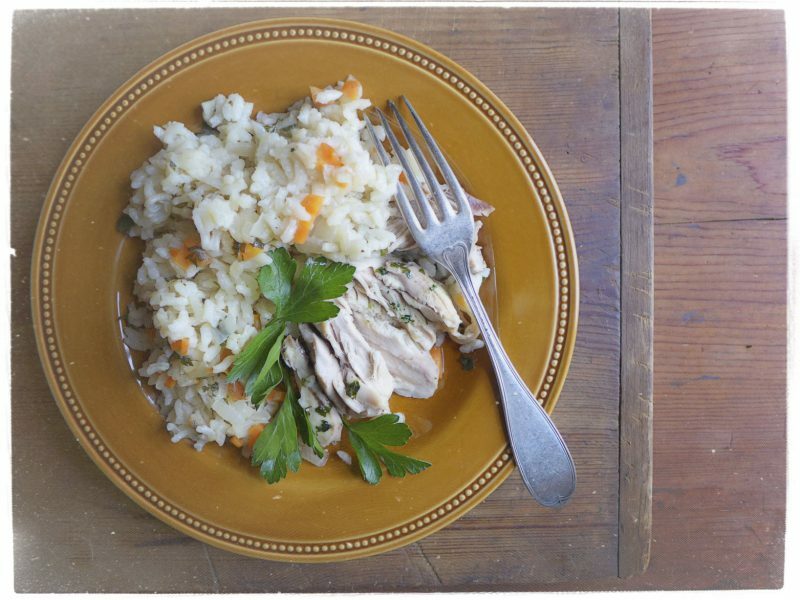 The bird defrosted in the sink, then into a pot it went along with white wine and a mirepoix to make a rich broth. 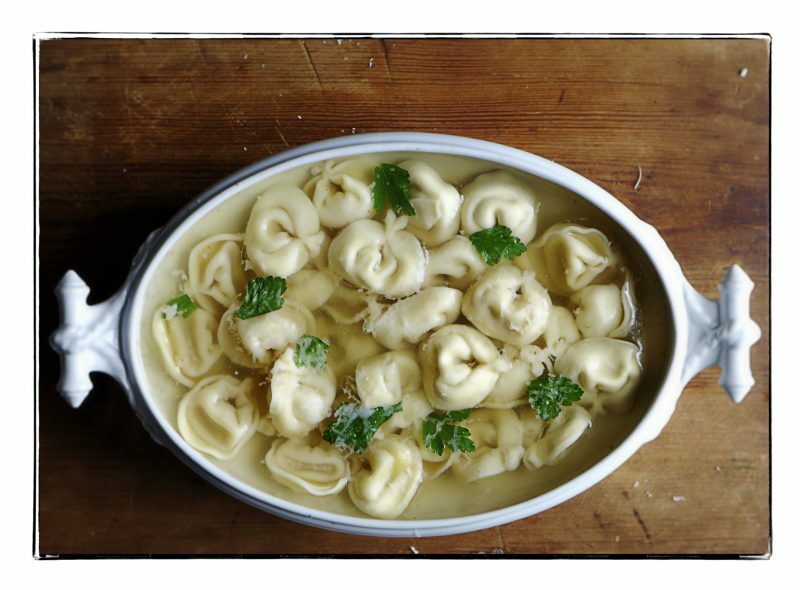 This afternoon we ladled some into a pretty tureen (a gift from a friend), floated cheese tortelloni in the warm golden brodo, and garnished it with a shower of grated parmigiano and a handful of parsley leaves. We set the orange rolling table for lunch then pushed it by the window to overlook the canal below. The ducks were swimming around in circles going crazy for each other. The chives in the flower boxes on the balcony are up six inches. Even on this cold blustery day, spring is right on schedule. Have a wonderful weekend, dear friends. The Cowgirl Creamery gals sent us some of their most delicious (and understandably most popular) Mt Tam triple cream cheese. 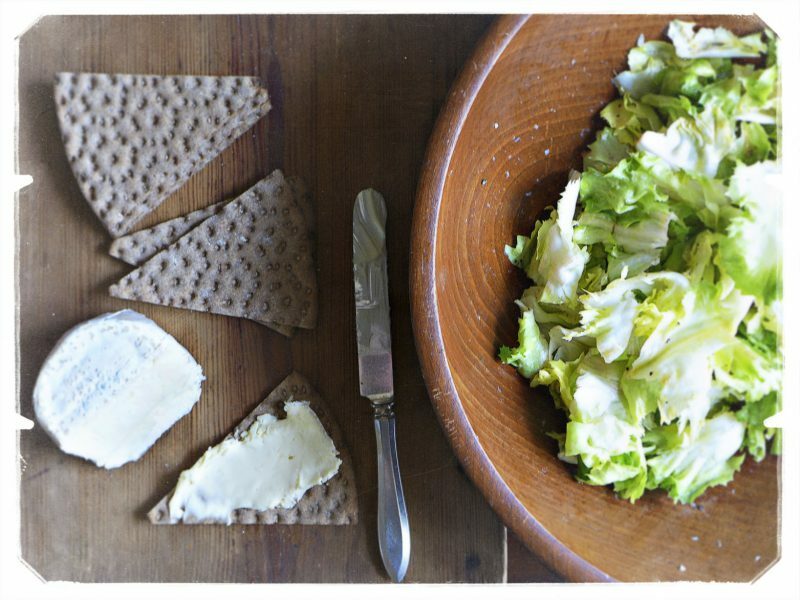 So, today we made an escarole salad with a lemony vinaigrette and we’ll eat it with crisp Ryvita crackers slathered with the cheese. Thank you, Cowgirls. For breakfast we split a ham sandwich on an onion roll with cups of coffee with cream. 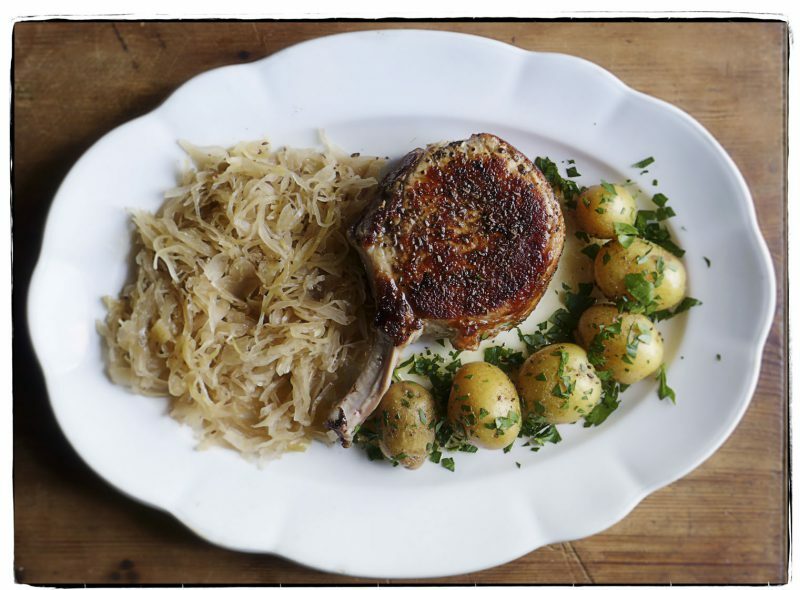 For lunch we are sharing a pork chop with sauerkraut with toasted caraway and brown sugar, and little spring potatoes with lots of fresh parsley. Today doesn’t know if it is warm or cold and neither do we! We are still eating as if it were the dead of winter. When we slip into the sleeveless Easter dresses, we hope we can! Pouring rain here, but it is kind of nice. We built a fire and put a little Iris DeMent and Greg Brown on the old stereo, so it’s down right cozy in the studio. We made delicious chicken and rice for ourselves. Now the trick will be to only eat one plateful. It is just the sort of day that we could finish the whole pot.